The enigma of spontaneous human combustion (SHC) is considered the most bizarre and frightening of all the phenomena in the world of the unexplained and the unknown. Some believe that stories of SHC are only urban legends, eerie tales of people bursting into flames that never really happened to real people. But this is not the case. Urban legends happen to a friend of a friend, but are really untraceable back to any true original narrator of the event. In the case of spontaneous human combustion, one is left with the charred remains and ashes of individuals who were once fully living, breathing, feeling human beings. Spontaneous human combustion is included in the chapter on ghosts and hauntings because for centuries certain scientists and psychical researchers have suggested that the phenomena may be due to some kind of internalized psychokinetic facet of the human mind. Poltergeists have been known to cause spontaneous outbreaks of fires, and mysterious fires and lights have been part of the repertoire of a haunted house since humans first began to keep records of such phenomena. Then, too, there are those theorists who place the blame for SHC directly on vengeful spirits or malicious entities from other dimensions of reality. Whatever the true cause of SHC, such accounts have haunted men and women for centuries, thus the mystery is placed in this chapter. In December 2001, a 73-year-old woman in Garden Grove, California, died from the third-degree burns that she had suffered over 90 percent of her body. 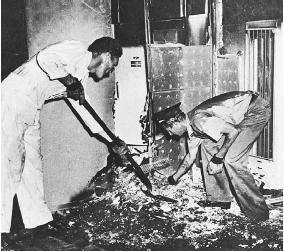 Firefighters and the coroner's office were left with the puzzle of how this could be possible when the fire took only four minutes to extinguish and was confined to a couch, a table, and the chair in which the victim was sitting. Was this another case of spontaneous human combustion? In many ways it is similiar to so many other unexplained instances of SHC. On March 24, 1997, 76-year-old John O'Connor was found dead in his living room at Gortaleen in northern Ireland. An intense and localized heat had left only his head, upper torso, and feet unburned, as well as the chair in which he was sitting. There was very little smoke damage done to the room or the furniture. In December 1956, Virginia Caget of Honolulu, Hawaii, walked into the room of Young Sik Kim, a 78-year-old disabled person, to find him enveloped in blue flames. By the time firemen arrived on the scene, Kim and his easy chair were ashes. Strangely enough, nearby curtains and clothing were untouched by fire, in spite of the fierce heat that would have been necessary to consume a human being. On August 19, 1966, Doris Lee Jacobs of Occano, California, burned to death in her trailer home at 1342 23rd Street. Although Jacobs suffered burns on over 95 percent of her body, the inside of the trailer was only partially scorched. Officials could offer no explanation for the fire, because it was the woman, not the trailer, who had burst into flames. How can human flesh be heir to such dangers as spontaneous combustion? Spontaneous combustion, it is assumed, is confined to oily rags and newspapers piled up in poorly ventilated corners of basements and garages. On September 20, 1938, in Chelmsford, England, a woman burst into blue flames in the midst of a crowded dance floor. No one was able to extinguish the blaze that seemed to be fed by her own flesh, and in minutes she was but a heap of ashes. On July 30, 1937, a woman who had been paddling about in a small boat with her husband and children at England's Norfolk Broads was engulfed by terrible blue flames and was nothing but a mound of ash in a matter of a few horrifying moments. Neither any member of her family nor the wooden boat was harmed. Dr. D. J. Gee, a lecturer in forensic medicine at the University of Leeds, England, wrote of a case of SHC for the journal Medicine, Science and the Law (5:37–8, January 1965). According to Gee, the victim was a slim, 85-year-old woman who lived with her son and daughter-in-law in a ground-floor apartment. Her family had left the apartment by 9:30 A.M. on the day she died. Neighbors had discovered smoke issuing from a kitchen window and found the smoldering remains of a human body on the hearth. When Gee visited the apartment two hours later, he noticed that the room was exceedingly warm and the ceiling felt hot. The paintwork was blistered and the walls and furnishings begrimed by soot. Only a part of the wooden edge of the hearth was burned, and a small section, approximately one foot in diameter, of the floor was damaged. The rug had not been burned, but it was greasy with tiny fragments of fat. A tea towel lying near where the body had been found was barely singed, and a large pile of dry firewood remained unaffected. Gee concluded from his examination that the woman must have suffered a heart attack and fallen into the fire. The body was ignited at the head by the fire and had been sufficiently inflammable to burn to such an extensive degree without any other source of heat, like a candle. The draft from the chimney had prevented the spread of flames to other parts of the room. That under certain conditions a body will burn in its own fat with little or no damage to surrounding objects. The combustion is not spontaneous, but started by an external source of heat. This has occurred where the body has been in the path of a draft up a chimney from a lighted fire. Oxygenation of the flue prevents outward spread of the fire. In order to test Thurston's theories, Gee conducted some experiments of his own. He learned that human fat, when melted in a crucible, would only burn at a temperature somewhere near 250 degrees centigrade. However, a cloth wick prepared in liquid fat will burn even when the temperature of the fat has dropped as low as 24 degrees centigrade. Gee also enveloped a layer of human fat in several layers of thin cloth in order to produce a roll about eight inches long. Combustion of the roll proceeded slowly along its length, burning with a smoky yellow flame and producing a great deal of soot. In both of these experiments, a fan was arranged so that combustion would proceed in a direction opposite the flow of air. Gee admitted that these experiments were by no means conclusive, but argued that they supported the theory put forward by Thurston, which he believed to be the most reasonable explanation for the occurrence of spontaneous human combustion. On April 7, 1969, Grace Walker of Long Beach, California, was found on the floor of her living room with burns covering 90 percent of her body. Although she was still alive when discovered, she was pronounced dead on arrival at the hospital. Investigating police officers said that the only signs of fire in the house were the ashes left from Walker's clothes, which had been burned from her body by the flames from her flesh. There were no burners lighted on the stove and not a single match was to be found in Walker's house. Friends and relatives said that the woman did not smoke and never carried matches on her person. The strange phenomenon of ball lightning has been used by many scientists in an attempt to explain the even stranger mystery of spontaneous human combustion, but it is as difficult to isolate in laboratories for study as SHC. In 1960, Louise Matthews of South Philadelphia survived an eerie experience that might substantiate the theory of ball lightning as a factor in at least some of the mysterious cremations that have taken place throughout the world and throughout all recorded time. Matthews claimed that she was lying on her living room sofa when she glanced up to see a large red ball of fire come through both the closed window and the venetian blinds without harming either. At first Matthews thought that an atomic bomb had fallen, and she buried her face in the sofa. But the ball of fire passed through the living room, into the dining room, and drifted out through a closed dining room window. Matthews said that it made a sizzling noise as it floated through her house. And she was able to exhibit visible proof of her experience: As the ball of fire had passed over her, she had felt a tingling sensation in the back of her head. Her scalp was left as smooth and clean as her face. In his experiments regarding the effects of fire on flesh and bone, Dr. Wilton Krogman, professor of physical anthropology at the University of Pennsylvania, tested bones still encased in human flesh, bones devoid of flesh but not yet allowed to dry out, and bones that have dried. He burned cadavers in a wide variety of fires fed by such combustibles as hickory and oak, gasoline, oil, coal, and acetylene. Krogman learned that it takes a terrific amount of heat to completely consume a human body, both flesh and skeleton. Cadavers that were burned in a crematorium burn at 2,000 degrees Fahrenheit for more than eight hours, burning under the best possible conditions of both heat and combustion, with everything controlled, are still not reduced to ash or powder. Only at temperatures in excess of 3,000 degrees Fahrenheit did he observe bone fuse so that it ran and became volatile. How, then, can a human being burn beyond recognition—in a number of cases in less than an hour—yet not cause the fire to spread beyond the chair in which the victim was sitting or the small area of the floor on which he or she might have sprawled? According to Krogman, the temperatures required to bring about such immolation should ignite and consume anything capable of burning within a considerable radius of the blaze. In what has become one of the classic cases of SHC, Mary H. Reeser of St. Petersburg, Florida, was last seen relaxing comfortably in an armchair in her apartment at 9:00 P.M. on Sunday evening, July 2, 1951. When a telegram was delivered to her 11 hours later, nothing remained of the 170-pound woman but a skull that had shrunk to the size of a baseball, one vertebra, and a left foot wearing the charred remains of a black slipper. St. Petersburg Fire Chief Nesbit said that he had never seen anything like it in all his years of investigating fires. Police Chief J. R. Reichart received an FBI report stating that there was no evidence that any kind of inflammable fluids, volatile liquids, chemicals, or other accelerants had been used to set the widow's body ablaze. A spokesman for a St. Petersburg mattress company pointed out that there is not enough material in any overstuffed chair to cremate a human body. Cotton, he said, comprises the basic stuffing of such a chair, and this material is often combined with felt and hair or foam-rubber cushions. None of these materials is capable of bursting suddenly into violent flames, although they do possess properties that enable them to smolder for long periods of time. At first Krogman theorized that a "super lightning bolt" might have struck Reeser, her body serving as a conductor to ground the current through a wall-type heater behind the chair. He discarded this theory as soon as he learned that local weather bureau records showed no lightning in St. Petersburg on the night Reeser met her bizarre death. Krogman remarked that he had never seen a skull so shrunken or a body so completely consumed by heat. Such evidence was contrary to normal experience, and he regarded it as the most amazing thing he had ever seen. If he were living in the Middle Ages, he mused, he would suspect black magic. Spontaneous human combustion seems to strike without warning and without leaving a clue. It seems to occur primarily among the elderly and among women, but there is no standard rule for these grim cases of preternatural combustibility. Nearly every theory, such as that those who imbibe heavily might be more susceptible to the burning death, has been disproved and rejected. At this time, no investigator has determined the critical set of circumstances that might bring body cells to the stage at which they might spontaneously burst into the flames that feed on the body's own fatty tissue, and SHC remains a baffling mystery in the annals of the unexplained and the unknown. Arnold, Larry E. Ablaze! The Mysterious Fires of Spon taneous Human Combustion. New York: M. Evans & Co., 1996. "Ball Lightning Link to Human Combustion." Ananova, December 12, 2001. [Online] http://www.ananova.com/news/story/sm_479064.html. Gaddis, Vincent H. Mysterious Fires and Lights. New York: David McKay, 1967. Rickard, Bob, and John Michell. Unexplained Phenom ena. London: Rough Guides, 2000.
has anyone ever tried to attribute women's hot flashes with shc? i get them so bad that sometimes i think my body could start on fire. doesn't it make some sense that maybe certain hormones could go haywire, causing this? that wouldnt really stick since most these eamples are far after the female body has stoped having those type of hot flashes from menapause or whatever. though i think the fact that as the body ages it dries out and stops making the natrual fluids that in it so dryer body would be more likly to born than say a younger person would who still had things working proper and natural fluids in body was normal. EMF? : electromagentic (or radio )frequency that uses directed energy. Direct Energy Weapons,(DEW's) exist. I agree with the theories of the scientist who believe in the wick effect. I see nothing super natural about this phenomenon. The 'cause of static is very possible, since there have been cases like that happening at gas stations. The wick effect is a very probable one aswell. There's not enough evidence, for me, to support the theory of one spontaneously combusting from internal means. I'd like to think that this is true, but there is no proof that it is, and i like proof... its a very weird thing to even believe in, internal combustion... FROM WHAT!?! i'd like to know why that would happen, then i may go for it. i think that spontaneous human combustion is spiritual..science cannot explain everything! there are other explanations that I can think of off the top of my head for some of these phenomenom. (i'll only deal with the ones in recent years). For instance, they are making the assmption that there are no other contributing factors to the fires. If a part of ones body was covered with lighter fluid (or one of the many other compounds that accelerate fires) the fire would burn very intensely for a short amount of time and would be less likely to spread to other areas not contaminated by the combustable material. Another possible scenario is electrocution. Without giving a detailed analysis of the internal condition of the body after the fire, we can't know if this is actually the case or not. But it could be that there was an electrical source that followed a conductor (could be something as simple as water) and electrocuted the body. Since water will evaporate eventually, if the body wasn't discovered immediately there would be no way of knowing if this actually occured, though it is a possibility. Even still, another, quite unsavory, proposition is murder. If we remove the assumption that the person died at the place where their body was found, then we can speculate that it could have possibly been murder in a different location, and only afterwards were they transported to their place of finding. Burning a body removes some incriminating evidence, so it's not as unlikely as may first appear. After all the cases and people's opinions I have read on this absolutely freakish occurrence (what an incredibly intriguingly horrific phenomenon), I would love to share my thoughts. The human body is full of energy and for some reason something goes haywire in the body causing an instant chemical imbalance/reaction and ignition internally. Temperatures engulf the body feeding off the chemical imbalance and fat stores. Similar to lighter fluid burning off your skin quickly and leaving your skin unscathed, the chemical reaction and fat burns so quickly fast and hot that it has little time or reason to ignite anything else around it. If I was a scientist I would look into the chemical compounds of the human body, all possible changes they could undergo or react with. I believe the answer is there somewhere. In most cases spontaneous human combustion has been related to persons, particularly females, who used to drink alcohol. Methane, ethane, propane and butane gas present in human intestines combined with oxygen are highly flammable and even explosive substances. For some unknown reason, these poor creatures have developed over the many years of their lives a dangerous balance of elements which conducted to a sinister and unpredictable outcome when combined with body fat. Nobody knows what causes a old person to ignite in such a way. But one thing is clear to me: although ignoring myself what fuses the fire, all the necessary chemical elements are present in our body and in fact could create an "inside-out" fire, which is the exact description of every one of those mentioned tragic events. There was a time that I believed (or wanted) it to be true. I have, however started to work in the petro-chemical field, and since have changed my opinion. The human body consists - even the old people - of roughly 80% water. That will act as a self extinguisher should you ignite. The only plausible explanation, in my opinion, is the wick effect. Some external source sets an incapacitated person's clothing alight and they are consumed by the fire that is fed by their own body fat. I would like to see more statistics though. Of all people that where supposedly victims of SHC, what where their life styles and habits? Did they consume alcohol? Where they smokers? Who did the fire investigations? Where they trained professionals or where they taught by "Old hands" how to investigate a fire. The trick of tasting the char or soot to tell if an accelerant was used is both outdated and dead wrong. We all know how many innocent people went to jail because they allegedly started a fire, just because some "fire investigator" were of the opinion they did. What other possible ignition sources where observed and considered? Compile this info, I'll sieve through it and then make up my mind. I think Vitrinite is closer to the truth behind SHC. Inept people or "pseudo-professionals" greatly hurt the process of uncovering the mechanism behind this and other phenomena. As any unknown physical or chemical manifestation... it needs unbiased observation, critical thinking (fine tuned problem-solving skills) and the COURAGE to expose phonies in the scientific field and those in the goverment's structure that support them!